If his campaign is any indication, Donald Trump’s presidency will usher in drastic, regressive changes to immigration, health care, and women’s rights in America. In response, Angela Bubash, a woman who appears to be slightly misinformed about just what is likely to happen, is rushing to stockpile enough deodorant to last her the next four years. Well, it seems like some wires got crossed somewhere, but okay! Way to take action, Angela! 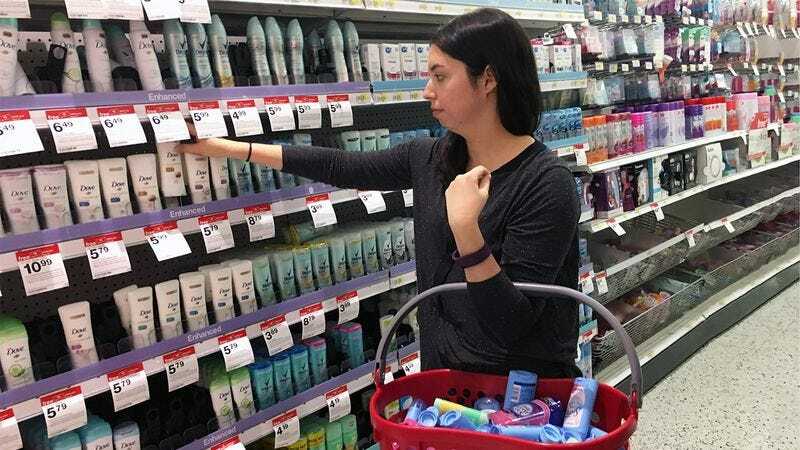 In the days since Trump’s victory, she’s cleaned out the deodorant inventories of multiple Omaha-area grocery stores, apparently under the impression that deodorant will soon become much more difficult to acquire than it is now. With the prospect of a menacing new world looming, Angela is taking some seemingly misguided precautions and buying up all the stick, gel, roll-on, and spray deodorant she can ahead of Trump’s inauguration ceremony on January 20. Wow. It’s unclear how she came to the well-meaning but mistaken conclusion that it was necessary to hoard hundreds of dollars’ worth of deodorant in preparation for Trump’s first term, but it’s hard not to be impressed by how much deodorant Angela has amassed in the past few days! Even if she’s a little off base here, Angela is showing the importance of not being complacent in the face of tyranny, and we think that’s awesome. Stay strong, Angela. You’ll get through this.